To Cite: Alipour V, Moein F, Rezaei L. Determining the Salt Tolerance Threshold for Biological Treatment of Salty Wastewater, Health Scope. 2017 ; 6(1):e36425. doi: 10.17795/jhealthscope-36425. Background: Wastewaters with high salt content disturb the metabolic function of microorganisms causing plasmolysis or activity loss in microorganisms, so the efficiency of biological treatment of saline wastewater by conventional microorganisms will decrease. Objectives: This study aimed to find the outbreak of disorder in the biological wastewater treatment process and how much salt leads to low efficiency in the wastewater treatment plant. 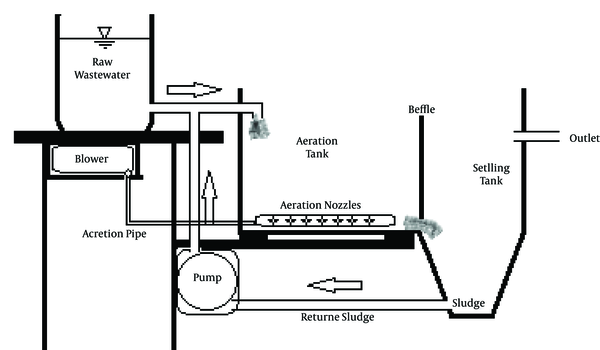 Methods: A study unit consisting of two aeration and sedimentation parts was used in this pilot research. Initially, 2 to 10 gr of NaCl was added to wastewater (WW) then aerated and settled for six and two hours, respectively. During a 10-weeks period, 10 samples were obtained and, the parameters of biological oxygen demand in 5 (BOD5), chemical oxygen demand (COD), total suspended solids (TSS), pH, turbidity, total dissolved solids (TDS) and mixed liquor suspended solids (MLSS), were measured. All experiments were done according to standard methods. Results: Removal efficiency of qualitative parameter including BOD, COD, TSS and turbidity showed a reduction of about 79.7, 73.9, 67.6 and 66%, respectively by addition of 8 gr/L of NaCl to wastewater. By increasing TDS by more than 4000 mg/L, biological treatment was done at a low efficiency and was disturbed with TDS of about 8000 mg/L, with efficiency of the treatment system strongly decreasing. Conclusions: For wastewater with high TDS content, modification such as dilution, collection system sanitation, application of halophytic organisms, the use of non-biological methods and so on is recommended. Currently the world is faced with a water crisis because of population increase, urbanization, public health promotion, climatic changes and so on, thus the need for new water resources is inevitable (1). Due to finitude fresh water resources, the reuse of treated wastewater (WW) can be a permanent water resource that may have numerous applications. In addition to reusable water production, WW treatment has a potential for environmental protection through reduction of waste, and production of energy, natural fertilizer and many other benefits (2, 3). Different methods are applicable for wastewater treatment, which are selected based on nature and characteristics of WW, climate conditions, economic and environmental limitations and so on. Since physicochemical methods are often costly treatment methods, many researches have been conducted regarding the application of substitutes of low cost methods. In most methods, aerobic and anaerobic biological treatments are the most widespread method for WW treatment around the world (4). The salinity of plant effluents depends on many factors including: lack of control in surface runoff and flood, high level of saline groundwater, and local dust such as sand that exist naturally (5, 6). Normally, saline wastewaters that are obtained from different industrial activities such as leather factory, marine products, drugs, and industries related to the extraction of crude oil and gas refining, are rich in organic compounds and have at least 1 to 3.5 g of TDS (7, 8). One of the chemical wastewater parameters, which plays a huge role in biological WW treatment is salt content, in a way that salt concentration of more than 1% (NaCl) causes plasmolysis of microorganisms and reduces their ability to remove organic and inorganic pollutants (6); on the other hand, discharge of saline wastewaters without treatment has considerable effects on aquatic life, and it causes immigration, death, destruction of organisms and imbalance of ecosystems. In year 2011, a study was conducted to optimize physical parameters such as temperature, inoculum size, pH, and salinity and incubation time, for the production of a salt tolerant enzyme secreted by a salt tolerant Pseudomonas Aeruginosa strain isolated from a type of saline wastewater (9). In 1995, Omil et al. could not determine the exact toxic effects of fish processing wastewater on an anaerobic system in a laboratory scale. They showed that bacteria are able to adapt with the existing salt density (10). The existence of salt resistant bacteria in biological saline wastewater treatment systems is necessary for decomposition of different organic pollutants. The important point is that anaerobic digestion systems are more sensitive to salinity content in comparison to activated sludge systems (11). Another treatment method of organic solids is aerobic digestion. Today, two types of conventional aerobic digestion and pure oxygen digestion are commonly applied. In conventional aerobic digestion, the sludge is aerated for a long time in an unheated outdoor pool by using conventional air distributor or surface aeration equipment; this process can be done continuously or intermittently. A batch method is commonly applied in small plants (12-15). High content of salt, about 5 g/L to 8 g/L, is accepted in order to process aerobic treatment of wastewater (16). Unlike the destructive effect of salt on microbial activity, activated sludge can treat saline wastewater to some degree. Adaptability successes of the mentioned treatment systems depend on various factors, such as the type and growth stage of microorganisms, and also gradual speed of density increase of salt in the process of adaptation. According to previous researches, the highest level of adaptation to salt has been seen in the bacteria Escherichia coli (17). One investigation indicated that the best way for improvement of efficiency of aerobic treatment process is using halophile bacteria, which can decrease the level of chemical oxygen demand (COD), biological oxygen demand (BOD), VSS, potassium, magnesium, phosphor, and TKN (18). Bandar Abbas is located in southern Iran along the Persian Gulf coast. In this region due to the high level of saline groundwater and the penetration of the water into the WW collection network, the WW entering the treatment plant has relatively high salinity. In some cases high salinity if WW leads to disruption of biological wastewater treatment process. This study aimed to determine the outbreak of disorder in the biological wastewater treatment process and how much salt leads to low efficiency in the wastewater treatment plant. In this pilot study, a two-part pilot, which consisted of aeration and sedimentation, was used; the first part’s dimensions were L = 27, W = 21 and D = 20 cm and the second part’s dimensions were L = 21, W = 10 and h = 20 cm. The effective volumes of first and second parts of the pilot were six and three liters. A small container was used as a storage tank, from which the WW was discharged (Figure 1). At the start of the pilot, 6 L of WW and 6 L of sanitary WW treatment activated sludge were mixed and poured into the storage tank. To achieve the test, electro-conductivities (1000 - 8000 EC µS/cm) and about 2 -10 gr of NaCl (Merck Company) was added to WW; then the WW was aerated for six hours and finally was transferred to the sedimentation apparatus for two hours. During a ten-week period, ten samples were obtained from the inputs and outputs of the pilot. Then, the tests of biological oxygen demand (BOD5), chemical oxygen demand (COD), total suspended solids (TSS), pH, turbidity, total dissolved solids (TDS) and mixed liquor suspended solids (MLSS), were done on the sample. All experiments were done according to standard methods at Azad University of Bandar Abbas. The tests of TSS, TDS, BOD, COD and MLSS were done based on standard numbers 2540 B, 2540c, 5210, 5220 and 5220 D of standard method reference, respectively (19). In order to determining the pH, the Metrohm pH-meter and to measure the EC, aqualytic conductivity-meter was used; turbidity was measured using the Hach turbidity-meter. Linear regression was used for data analysis and determining efficiency level of removing the mentioned parameters. The initial and final wastewater characteristics (before and after adding the salt) are presented in Table 1. As indicated by Table 1, with the addition of salt to the WW, some parameters like EC and TDS showed a lot of changes compared to their original value; while in some other parameters like BOD, COD, MLSS and TSS changes were less than the EC and TDS. By adding salt to WW, the average amount of BOD, COD, TSS and TDS increased by about 6%, 14.5%, 14%, and more than 200%, respectively. The minimum increment was related to pH with 1.4%. After salt addition to WW, it was time for the aeration and settling stages; the results of this section are shown in Table 2. The effect of different amounts of salt on removal of four major parameters in a wastewater treatment plant is presented in Figure 2. As the figure shows, there was a uniform trend for reduction of all parameters; however, there was a small difference in the amounts of removal for the presented parameters (Figure 1). By increasing TDS level of wastewater, there was a significant decrease in removal efficiency of all mentioned parameters, so by increasing the TDS from 2182 to 8457 mg/L, removal efficiency is decreased from 90.5% to 10.8%, and there is a significant relationship between these two variables (P < 0.05). The highest (87%) and lowest (16.33%) COD removal efficiency was observed with minimum TDS and TDS of more than 8100 mg/L, respectively (91.9 and 18 % removal). The maximum (93.4%) and minimum (25.8%) TSS removal efficiency was achieved at a TDS concentration of 2182 mg/L and 8457 mg/L, respectively. Regarding the data associated with removal rate of the four-presented parameters, BOD5 was the most sensitive parameter against TDS increase, and the lowest impact of increased salinity was related to turbidity (difference between the highest and lowest removal rate were 79.7% and 66% for BOD5 and turbidity, respectively). Based on results, with an increase in TDS, removal of BOD, COD, TSS and turbidity was decreased, which can be due to the sensitivity of bacteria to salts and lack of adaption of the microbial type responsible for treatment of saline wastewater. The biological treatment of wastewater with conventional microorganisms leads to an efficient decrease of wastewater pollutants removal, especially BOD and COD. As stated in previous studies, the presence of high concentration of salt in wastewater leads to plasmolysis or reduction of bacterial activity (20); the study of Amin et al., showed that at < 5000 mg/L of NaCl concentration, the protozoa species were observed clearly, while at higher concentration of NaCl (> 5000 mg/L), the protozoa population were significantly reduced or even disappeared at the higher end of the studied NaCl concentration. The results of the mentioned study, confirm our findings, in which with TDS above 6000mg/L, more than 60% reduction was observed in wastewater organic load. This is because aerobic bacteria, by using oxygen dissolved in aquatic environments, oxidize and decompose organic materials (21). Salinity has an undesirable effect on microorganisms; causes lysis of the cell wall, loss of the cell wall and eventually cell death. Therefore, the effect of microorganisms on the treatment of organic compositions will decrease. The main part of wastewater turbidity is caused by the conversion of dissolved to suspended materials, as a result of biological deposition. As in high content salinity, biodegradation is reduced, changing the dissolved to suspended materials is done less, so effluent will be turbid. This is the main mechanism by which salinity influences turbidity removal. The linear regression test was done and the statistical test showed that there is a relationship between the reduction of removal efficiency for wastewater TSS and turbidity, and the increase of wastewater salinity. The results showed that the biological treatment of wastewater in TDS up to 4000 mg/l (EC = µs/cm 7273) is economical and technically is acceptable. By increasing TDS more than 4000 mg/L, biological treatment is done at a low efficiency and it is disturbed at TDS of about 8000 mg/L, where efficiency of the treatment system strongly decreases. According to the findings of this study, organic content removal has the greatest impact on increased salinity wastewater; while settleability showed the lowest impact. Given that salt can cause problems in biological wastewater treatment process, contamination of wastewaters with salt should be avoided. In situations with WW with TDS content more than the above range, modification options for WW treatment, have to be considered; dilution of ww, sanitation of collection system, the production of halophytic organisms and application of these organisms to saline WW treatment, the use of non-biological methods and so on. The authors appreciate the natural resources department of Azad University Branch of Bandar Abbas. Authors’ Contribution: The overall implementation of this study, including design, data analysis, and manuscript preparation was the result of joint efforts of all coauthors of this paper. All authors made extensive contributions to the review and finalization of this manuscript. Funding/Support: This study was supported in part by Hormozgan University of Medical Sciences and Azad University branch of Bandar Abbas.